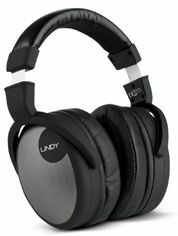 Lindy Premium hi-fi headphones review | What Hi-Fi? Wearing these Lindys is a little like being in an American hotel room – you’re unfathomably comfortable, but everything seems just a little too big. But look at the price – £75. Around a tenth of the price of the most expensive cans in the test. And they don’t feel especially cheap. They’re well built, use copper-clad aluminium wire voice coils, and come with a detachable three-metre cable. There’s also an adaptor for kit with a headphone jack of 1/4in rather than 3.5mm. And, when you get them into action, they deliver a solid, expansive and reasonably detailed sound, with lots of bass punch to go with decent amounts of midrange and treble insight. There is, however, a slightly hard, brittle quality to the upper midrange and low treble, which can make poor recordings sound a little unforgiving. Play Jay-Z’s The Black Album and they make a good fist of serving up the soul-fuelled beats and scattershot samples, but the performance is slightly haunted by that uninviting brittleness. But it must be said, this is a minor criticism at the price. Open, exciting and dynamic: if you insist on spending less than £100, audition these.